We like to think that marriage is a beautiful thing, and that getting divorced is the worst ending anyone can have. But the truth is, the divorce rate today is so high that we shouldn’t be shocked if someone we know tells us they’re getting a divorce. The map above lets us compare the divorce rate around the world. 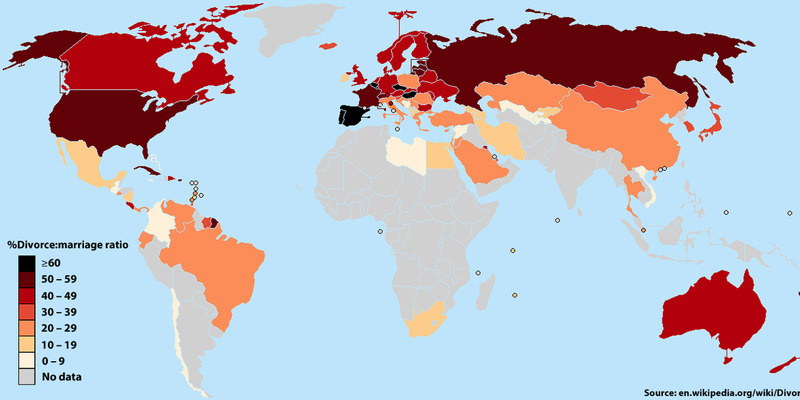 We can see that a lot of the areas are coloured red, indicating a divorce rate of 40% or above, which means a high divorce rate is now a worldwide phenomenon. As of 2016, the Maldives has the highest national divorce rate, with 10.97 couples out of 1000 people divorcing each year. Not far behind is the US at 3.6 divorces per 1000 people each year. This makes us wonder: why do we want to get married in the first place? Do the reasons for getting married also explain why so many of us regret later on? Initially, people get married because it somehow locks themselves up from temptations which can be bad for them in the long term. You may have heard of a psychology experiment called the ‘marshmallow test’. What it tells us is that some children have a harder time resisting the temptation of instant happiness, even if they are told waiting will bring more satisfaction at a later time. And, unfortunately, their lack of impulse control seems to continue to affect them when they grow up, making them less successful in life. This perhaps explains why affairs and one-night stands—the regrettable mistakes, usually happen on the spur of the moment. It is human to have impulses, but we need something powerful to help us fight the bad impulses at moments of weakness. Which is why some people choose to get married: they voluntarily get ‘locked up’ by committing to a marriage, hoping that it would make them feel guilty enough to stay away from their darkest desires when any arise. They want to be reminded of what is important in the long run. And instead of getting married out of wants, some people get married out of “need”; which is a little different. Now that we know not every couple get married for the right reason (love, perhaps? ), it is easier for us to understand why so many people get divorced eventually, and why some of us even regret doing something so beautiful. The problem is that people don’t always get married because they want to spend the rest of their lives with the right person. Rather, they get married because they are afraid to stay single, want someone else to make them feel secure, or because they feel pressured by their parents, etc. Yes, all these reasons make sense; but none of them is about what people truly want or how they really feel. They might not want to get married, but they simply think that they have to get married. These days, some people even get married because marriage has become a status symbol that represents success in personal life. This may sound funny, but it’s actually what we as a society believe. In the modern language, ‘married’ somehow translates to ‘successful’. People believe getting married put them in a privileged position, one superior to what’s represented by other forms of relationship such as cohabitation, according to a document written by the US Justice Department. Indeed, marriage requires us to have the ability to support ourselves. Getting married can mean that we have a stable income, a place to live, etc., and the society recognizes that. It is natural to want to show off to family and friends, but some don’t realize the weight of marriage and are uncertain about what they’re committing themselves to. While people are not getting married because of wanting to make their relationship better, they are also unaware of what getting married really means. If we look at some of the wedding vows today, it’s not hard to tell that most of the time only the good about marriage is being said: I will love you and you alone no matter what. Instead of bringing up the reality, marriage is being fantasized like a fairy tale. Not really realizing that marriage itself is a promise a couple should keep in the future, many never imagine what could happen after getting married, or who they might become after marrying each other. Instead of fantasizing about marriage, a wedding vow should be realistic for everyone to understand what marriage really means. This is because our current vows tend to be very optimistic, and when things don’t turn out as expected in the end, people get upset, regret everything and want a divorce. The ideal vow should warn us of the cold truths about marriage. For example, it will be difficult to tolerate the quirks or the other, or, we most definitely will have arguments and break each other’s heart. We need to be prepared. We don’t want to regret getting married only after we’ve had a taste of the bitter reality. Many days we’ll be unhappy; many days, we’ll suffer, many days we’ll regret we ever did this crazy thing. It’s not congratulations we need, it’s commiserations. Keep in mind that while it is important to have realistic expectations when deciding to get married, we shouldn’t be discouraged or feel hopeless about marriage. We only need to slow down and learn what it really means to be married, and be honest about what we truly want. This article is inspired by The School of Life’s What our Wedding Vows should Say, watch the video here . ^ Andrew J. Cherlin: In the Season of Marriage, a Question. Why Bother?